You have an idea. You are excited. You tell others. You may even have a plan. Then something happens. You walk away, and assume that they are implementing your idea, your vision, and your plan. In your mind, “it’s running itself.” Your work is complete, because you not only came up with an amazing idea, your inspired them so uniquely that their motivation, their loyalty, and their efforts were completely aligned with your vision. You did your part, now it is in their hands. You move on to the next big idea. Don’t hear this wrong. Big ideas are great. We should dream, we should develop ideas, but sometimes the idea or coming up with a vision of what you would like to do, be, or accomplish is the easy part. The more difficult part is making your idea happen. Implementing your vision takes discipline and hard work. Working hard at the daily tasks needed to make your dream a reality is not glamorous. You have to make sacrifices, and you may even fail. Discipline can seem overwhelming but you can start small, with just a few minutes each day. You may be surprised where it takes you, and those around you who usually are tasked with trying to implement your big idea may breathe a sigh of relief. We all have blind spots. You have them, I have them, we all have them. The hardest part about blind spots is that we do not see them. I suppose that is why we call them “blind spots.” When this happens while driving, another car can essentially disappear from view, yet be right beside us. If we turn or change lanes, the damage will be immediate and severe. When our blind spots are personal, the damage is no less great, but they can occur gradually…almost without our notice. Until we discover our personal blind spots (typically because someone else points them out) we tend to just plug along not realizing the damage we are causing by this inherent flaw in our perspective. I was stunned. I resisted the natural urge to defend myself and just listened. Arguing about your blind spot is as foolish as turning your car into that crowded lane because you just know there is no car there…while hearing the crash. Instead I listened. I really listened. It became clear that the “My Way” blind spot was real and having an impact on others. My tendency to delegate without freedom created tension and a lack of trust. Over time, this can create followers who feel unable to be creative or do things their own way. Identifying the blind spot was the first step. The next, and much harder step, is trying to figure out how to change a pattern of behavior that I didn’t know existed. It will not be easy, but leading well never is. 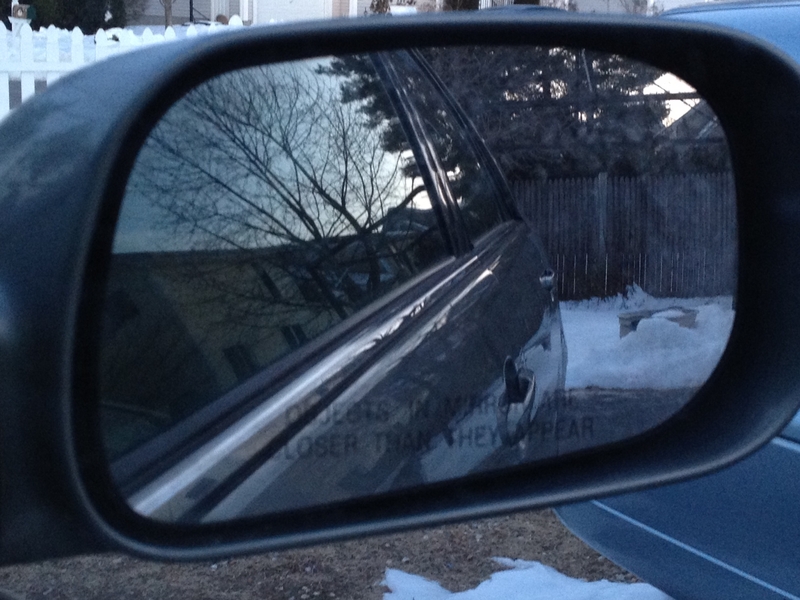 I will have to check those mirrors a little more often before changing lanes. What is your blind spot? Where are you speeding along without seeing what is right beside you? Are you causing unaware damage? My advice today is simple: Listen and look. But be prepared to deal with what you find.